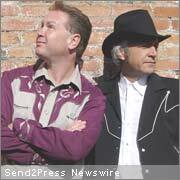 REDDING, Calif. — Scott Joss and Doug Colosio, taking time off from their regular gig in Merle Haggard’s band The Strangers, have released a new tune through Golosio Publishing that recaptures the country swing of such greats as Bob Wills, Milton Brown, and Asleep at the Wheel. Titled “I Wonder If I Do Too Much,” the song is full of humorous memories of a life of parties and frivolity. Balancing out that viewpoint are some rueful comments about not always remembering everything that happened during the merriment. Speaking of which, an image of a candle burning at both ends is in the video for “I Wonder If I Do Too Much,” along with scenes of merrymaking, cocktails, party favors, streamers, eye charts (both in- and out-of-focus), and animated swirls of colorful bottles of alcohol. Songwriter and keyboard player Doug Colosio has performed with Willie Nelson, Merle Haggard, Charlie Pride, Jewel, and many others. You’ve heard Doug on the radio, you’ve seen him on Letterman, Leno, Austin City Limits, and in concert with some of the most important figures in today’s music. His recording, “American Piano,” is part of the Sony Sound Series. Songwriter, guitarist, mandolin player, singer, and master of the fiddle, Scott Joss moved from winning the California State Men’s Fiddle Champion three consecutive years to playing with Dwight Yoakam, Pete Anderson, Tiny Moore, Roy Nichols, Dusty Wakeman, and his fiddle teacher, Jana Jae (of Buck Owens fame). Joss and Colosio are currently members of Merle Haggard’s band, The Strangers. Along with John Scott G, both are partners in Golosio Publishing. The video, produced by FookMovie, is also available on YouTube, Veoh, Blip, and the Joss/Colosio page on Beta Records: www.betarecords.com/scott.joss.and.doug.colosio .